Karina is a first generation Cuban-American from Miami, Florida. When she was growing up she would "lip-sync shows" to her family. She also "lip-synced" songs while in high school, but says she did not really become "aware of her voice" until she was 19 years old. She never took voice lessons or sang live until that time. She considers herself to be a "late bloomer" with her musical career, but also says "better late than never". Karina says she feels "quite blessed" to have shared the stage with Celia Cruz, Tom Scott, Ray Parker Jr., Jeff Kashiwa, Johnny Britt of Impromp 2, Paul Shafer and Dan Siegal. She also says "I have a band that I am quite lucky to have perform with me on stage and on the NUVOSOUL CD. They are some the top musicians out there that work with other Amazing superstars of all genres. Hopefully I can continue this wonderful trend". 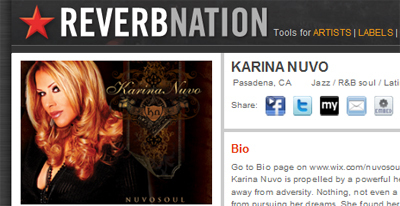 Karina's music is described as being "a sultry combination of Soul-Jazz and Latin" Notably, she co-wrote, co-produced and sang the songs in both English and Spanish "to create a unique sound" she calls "NuvoSoul" and the title of her latest CD " NUVOSOUL" released July of 2008. 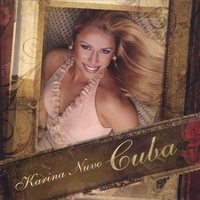 Karina also has an EP titled " Cuba" available on CD Baby. DCB: I read that you had an "initial bout with stage fright". During this time, what was your most challenging experience? Do you remember when you overcame the phobia? KN: Well its not as extreme at this time but I am still quite nervous before a show. My most challenging experience was any time it was a competition, I hate contests , everyone has there own style and should be judged individually. DCB: When did you begin writing and performing your music in the Miami area? What groups were you performing with at that time? KN: I did some events around town sponsored by a radio station with a song I co-wrote called LOVE GAMES, but then I started feeling sick after moving to Los Angeles. DCB: While in California, you suffered a medical set back that pretty much shelved your career for six years. While you were not performing, it sounds like you were still cultivating your network of connections. What actions did you take to keep in touch with your associates? KN: I actually wasn't in contact with anyone , I was quite depressed over my physical condition and didn't have the will to deal with anyone in the music business. Then I had my last surgery and I was feeling better when I got up to sing at a party and as they say in the" GODFATHER PT 3 "They pulled me back in" hehe. DCB: Of all your performances, what is the most memorable? KN: My Most memorable moment so far is my first sold out show in Orlando thanks to 103.1 (WLOQ fm) for playing my songs on the radio. The power of RADIO is unbelievable and that night was amazing. DCB: Do you think you will have the opportunity to perform in Cuba? KN: From your mouth to Gods ears, but when I am free to sing what I want there and its people are free to listen.